Post a deliveries sign to inform visitors and delivery trucks where to head to drop off packages. Deliveries signs help eliminate confusion and maintain an organized facility and Seton has all the delivery signs you need. Choose from a variety of materials, such as self-adhesive vinyl, rigid plastic, steel and aluminum, and reflectivity options that are MUTCD compliant. We also offer a “No Deliveries” Shipping and Receiving Sign that is ideal for improving warehouse communication. These signs come with a write on area and are resistant against weather, fading, solvents, chemicals and abrasion. Keep your business running smoothly with deliveries signs from Seton. Keep your business running smoothly using deliveries signs from Seton. 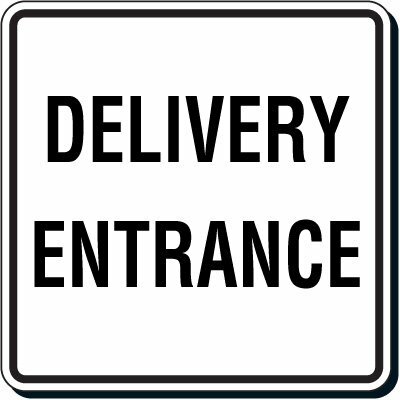 Posting a deliveries sign is an effective way to communicate to delivery trucks where to head to drop off important packages or documents. At Seton, we offer a range of delivery signs with clear messages and directions, including directional arrows, to point visitors in the right direction. Choose from a variety of different sizes and durable materials to best suit your needs. We offer signs in non-reflective steel, durable plastic and self-adhesive vinyl. We also offer MUTCD compliant signs in engineer grade reflective aluminum and high intensity reflective aluminum. Additionally, we offer many different messages in stock and ready to ship today. 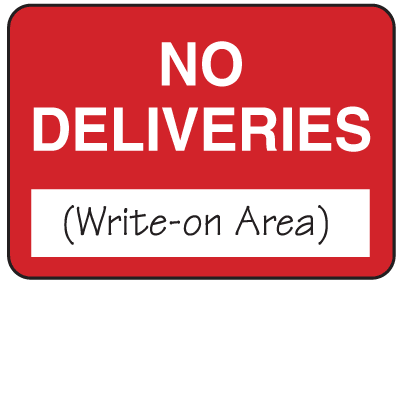 Choose from messages such as “All Deliveries In Rear,” “No Parking, Service And Delivery Area,” as well as signs that read “Deliveries” and feature directional arrows. Maintain a compliant and organized business using deliveries signs from Seton.